Corporal Tony Stein (30 September 1921 - 1 March 1945) was a U.S. Marine who was posthumously awarded the U.S. military's highest award for valor, the Medal of Honor, for his heroic actions during World War II. Tony Stein was born in Dayton, OH, on 30 September 1921, and attended Kiser High School. 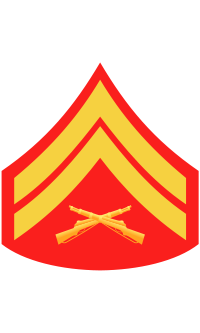 He enlisted in the U.S. Marine Corps on 22 September 1942. 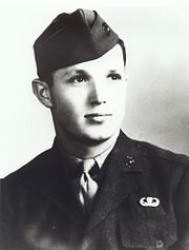 On 19 February 1945, while serving with Company A, 1st Battalion, 28th Marines, 5th Marine Division, in action against enemy Japanese forces on Iwo Jima, in the Volcano Islands, Stein was killed during a mission in which he and a group of fellow Marines had volunteered to locate some enemy machine gun emplacements which were holding up the advance of his entire company. He was killed less than two weeks later during another battle. For his heroic actions on 19 February 1945, he was posthumously awarded the Medal of Honor. Corporal Stein's Medal of Honor and citation were presented to his widow on 16 February 1946 during a ceremony in the office of Governor Frank Lausche of Ohio. The USS Stein (FF-1065), a United States Navy Knox-class frigate, was named in honor of Corporal Stein. Corporal Tony Stein was killed in action on 1 March 1945. Following the war, his body was returned to the United States from the 5th Division for re-interment at Calvary Cemetery in his birth city of Dayton, OH. His grave is located at Section 8, Row 9. Corporal Stein, Dayton's only World War II recipient of the Medal of Honor, was buried with full military honors on 17 December 1948 following funeral services in Our Lady of the Rosary Church.